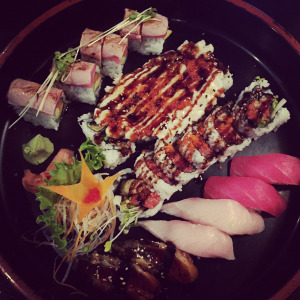 A year ago or so, we took a lunch break from our office in WS to Xia to check out their sushi. It was pretty good, but we really didn’t get back there (even though it’s next door) because we discovered that Wen Hwa (a few blocks over) was the microfoodies’ favorite place to eat in the history of kidkind. So we went to Wen Hwa. A lot. And that was our Asian Fusion fix for a good 6 months. Until the unspeakable happened. Wen Hwa was damaged in a fire a mere 2 hours after we had just eaten lunch there. We waited and waited for months, but it just didn’t open. And then recently they announced they would not reopen. Anyway, we went back to Xia because guess what??? They also have Pho. Pho! Something that’s been absent in this town. We have had no Pho in #WSNC. But Xia has it. And you should check it out. And all the other stuff they have too. Heck, try the sushi too. Read all about it here. This is the Honey Sesame Chicken. Ours order it with no sesame. Very similar to General Tso. It will look like this, but be spicy. This entry was posted in foodie b'eat, Restaurants, You Should Eat Here! and tagged $$, Asian, Asian fusion, Chinese, Downtown Winston-Salem, Pho, Spring Roll, Sushi, Vietnamese on November 5, 2015 by triadfoodies.